Russian - Turkmenistani talks. Press statements. Putin.BLOG Foreign Policy Turkmenistan Russian - Turkmenistani talks. Press statements. 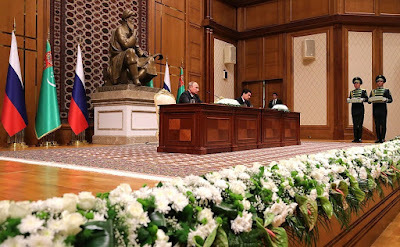 Russian President Vladimir Putin and President of Turkmenistan Gurbanguly Berdimuhamedov made press statements following Russian - Turkmenistan talks. Vladimir Putin and President of Turkmenistan Gurbanguly Berdimuhamedov made press statements following Russian Turkmenistan talks in Ashgabat. It is my sincere pleasure to present a prestigious state award, the Order of Alexander Nevsky, to the President of Turkmenistan. Prominent political leaders of foreign states receive it for outstanding personal contributions to strengthening neighborly ties with Russia. Mr. Berdimuhamedov, you are known in Russia as a consistent supporter of the closest possible strategic partnership between Russia and Turkmenistan. Our bilateral cooperation is developing on the solid foundation of friendship and mutual understanding, on the principles of equity and respect for each others interests, largely owing to your efforts. Of course, your concern for the Russian language deserves special mention. Today, it is taught in the majority of Turkmen schools. Russian is also widely used as a language of inter-ethnic communication in Turkmenistan. We see in this your aspiration to work together to strengthen bilateral ties. Russia respects Turkmenistan’s neutral status. We greatly value the role your country plays in ensuring peace and stability in Central Asia. We have supported your initiative – the UN General Assembly resolution to celebrate International Day of Neutrality. A Turkmen proverb tells us that the source of prosperity lies in action. Literally in these past few years, Turkmenistan has made an impressive leap forward in its development, while the city of Ashgabat has become a jewel of Central Asia and a venue of large international forums. The Fifth Asian Games were held in Ashgabat with great success in September. Moreover, Turkmenistan became the first Central Asian state to receive the right to host this large-scale competition in 21 sports, in which athletes from over 60 countries, primarily Asia and Oceania, took part. In conclusion, I would like to cordially congratulate you once again on receiving the Order of Alexander Nevsky. Mr. Berdimuhamedov, I wish you excellent health, prosperity, and, of course, new successes in high office. Mr. Putin, naturally, I would like to express my gratitude for this high honor, the Order of Alexander Nevsky. I see this award also as an award to the people of Turkmenistan, who consider Russia a friend, and as an obligation to strengthen our traditionally friendly relations based on mutual respect and trust. Indeed, our countries have done a lot together over these years, especially in the areas that you have mentioned. We are a neutral country and I can say that I am proud that Turkmenistan is the only neutral country about which the UN General Assembly has adopted two resolutions. The policies that you relentlessly pursue in the interests of peace all over the world and your contribution are very important today, I would say, to all people on the planet. Thank you once again for this high honor. I wish you great success in your presidential activities, and I wish all the best to the people of Russia. Mr. Putin, ladies and gentlemen. We held productive talks today during the official visit by President of Russia Vladimir Putin. Our talks were held in the spirit of openness, mutual trust and understanding. We discussed Turkmenistan - Russian relations and their future and outlined the practical priorities of our cooperation. We also confirmed the long-term strategic nature of our cooperation and expressed readiness to do everything in our power to strengthen and make use of the huge potential of partnership that is available in Turkmenistan and the Russian Federation. We focused on strengthening global peace, stability and security. I would like to point out that Turkmenistan and Russia have similar or identical views on many international and regional political issues, which is an earnest of our successful cooperation on the global stage. We will continue to provide mutual assistance to each other at the UN and other respected international organizations, a practice that has proved to be very effective. Our countries will continue to cooperate in the fight against modern global threats, such as terrorism, drug trafficking and transnational organized crime. This cooperation will proceed at the bilateral level and also within the framework of international organizations. We also held in-depth discussions on cooperation in Central Asia. In this context, we pointed to Russia’s regional importance as a major component of strategic stability in Eurasia, where large-scale energy, transport and environmental projects of global significance are being implemented. 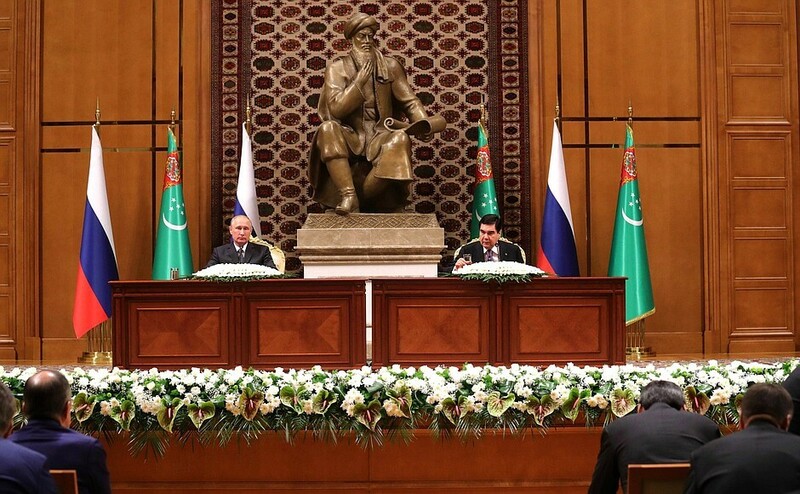 Turkmenistan has always upheld and will continue to uphold Russia’s vision in this sphere. We also reaffirmed both countries’ commitment to our close cooperation in the Caspian Sea based on the principles of good-neighborliness, equality, mutual respect and consideration for the interests of all Caspian states. Turkmenistan and Russia welcome and support the signing of multilateral agreements on Caspian cooperation in trade, the economy, transport and other areas. In this context, we noted the importance of using our countries’ port infrastructure on the Caspian Sea in Turkmenbashi and Astrakhan, and the ferry line linking them, as well as the planned Turkmen trade and logistics center in Astrakhan Region. 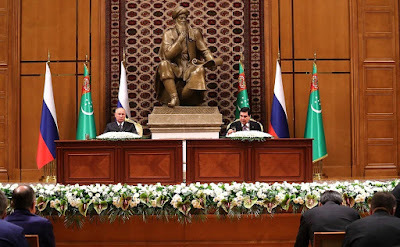 Turkmenistan and Russia both support the Afghan crisis resolution through political and diplomatic means on the basis of a broad nationwide dialogue and the leading role of the United Nations in that country’s integration into regional economic and infrastructure projects. During the talks, we also noted the consistent and interested and, I would say, mutually beneficial nature of the trade and economic partnership between Turkmenistan and Russia, and confirmed our mutual readiness for its expansion, especially as regards diversifying and increasing the product range in mutual trade. Energy, transport, telecommunications, agriculture, technology, services and several other sectors were singled out as priority areas. Turkmenistan also welcomes the expansion of major Russian companies’ operation in the Turkmen market, emphasizing its long-term nature. In this context, we reaffirmed the importance of Turkmenistan’s trade and economic partnership with a number of Russian regions, something we are working on now. The two countries’ cooperation in culture and the humanitarian sphere was also given the attention it deserves in the course of the talks. We reaffirmed our mutual readiness to expand it further, to promote contacts in culture, healthcare and sports. We expressed appreciation for the standards of cooperation in research and education. This long-term and system-wide cooperation is growing stronger with every year, as you can see from the cooperation agreement signed during this visit between the leading universities and research centers in Turkmenistan and Russia. This agreement offers great opportunities for research, student exchanges, as you have said, and the implementation of joint educational programs and projects. We highly appreciate and are grateful to Russia for its invariable support to the training of Turkmenistan professionals at Russian universities. Ladies and gentlemen, this visit has confirmed that the Russian Federation is our reliable friend and a responsible and honest partner. We are grateful to Russia for its support to Turkmenistan’s political neutrality and international initiative on the current issues of global development. For its part, Turkmenistan always supports Russia’s constructive endeavors. We are especially grateful to President of Russia Vladimir Putin for his great personal attention to cooperation with Turkmenistan. We are deeply satisfied with the results of this visit, during which we signed a large package of bilateral agreements in various spheres. Turkmenistan and Russia have demonstrated yet again their resolve and striving for a close, multifaceted and long-term dialogue, which is in the interests of our peoples and is making a great contribution to maintaining and strengthening global peace, security and stability. Ladies and gentlemen, I would like to express my respect and to say that I am honored to award a state decoration to the President of Russia. As I have said, Turkmenistan as a neutral country conducts an open door policy under the UN auspices, and we award this decoration in recognition of Mr. Putin’s contribution to our cooperation. Mr. Putin is a wise, prominent politician, who is doing a lot on matters of stability and security. Therefore, let me award this decoration to you. I congratulate you on my own behalf and on behalf of the entire nation, and I would like once again to wish you great success in your state activities and again wish all the best, prosperity and happiness to the entire great people of Russia. First of all, I would like to thank you for this state decoration. Let me note in this connection that this is an award to our entire big team that has worked for years to create, without any exaggeration, a new type of interstate ties. What I have in view is that we were part of a single state for many years but now we are building relations at the level of sovereign countries and members of the United Nations and, to my mind, we are doing this very honorably and successfully while overcoming various difficulties that we encounter along the way. I am confident that in the future we will continue acting as effectively as we have until now. As for our joint work today, I would like to note that the talks were held in a very constructive atmosphere. We have noted that our views coincide or are very close on practically all international issues. We have exchanged information on the key and most acute points on the planet, we have compared notes on [the situation] in the post-Soviet space, and we have discussed the situation in Central Asia and Afghanistan. We have certainly prioritized the development of trade, economic and humanitarian ties. We have noted that we have many good opportunities in various areas: This concerns machine-building, transport infrastructure, healthcare, education, science and culture. Today you saw the signing of a hefty package of documents in practically all of these areas. I am confident that all of this will be implemented under the guidance of the Intergovernmental Commission that has operated for several years and done so quite successfully. I would like to thank our hosts for organizing today’s meeting and for the atmosphere that has been created for today’s joint work. 0 Comment to "Russian - Turkmenistani talks. Press statements."